The global market for Highly Potent Active Pharmaceutical Ingredients is currently largely driven by its major use in oncology for cancer treatment and more often in the form of ADCs. 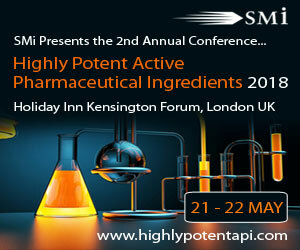 Over a quarter of drugs worldwide now contain HPAPIs, as they have proven to be more effective than other APIs. However, working with APIs high in potency and cytotoxicity comes with many regulations and requirements, and presents pharmaceutical companies with challenges such as handling, containment, cost and security questions. This conference will cover many important and in-demand aspects of the HPAPI industry, creating a networking platform for industry professionals and key players to share their knowledge and find innovative new solutions. Brief Overview: Learn key HPAPI project elements, what factors are important and how to build information designed to underpin HPAPI project investments. Brief Overview: This workshop will provide an overview of the regulatory basis for ADEs and PDEs, will discuss how they are determined and present the basics of preventing cross-contamination. Register online with special early-bird rates available!